Use coupon "APRIL-10" on Nitrotech Performance Nighttime 908g and save 10%. 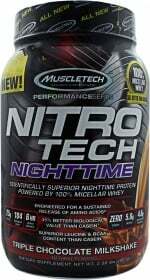 MuscleTech https://www.zumub.com/images/large/muscletech/muscletech-nitro-nighttime-900_LRG.jpg 1MCT6130 There are no reviews yet. To keep your muscles constantly supplied with protein while you sleep, a slow-digesting protein source is what you need. If you are looking for a great-tasting source of sustained-release whey protein, Muscletech Nitrotech Performance Nighttime is ready to meet your demands! When we mention slow-digesting proteins, micellar casein is what usually comes to mind. While micellar casein is also a complete protein source, studies have been shown that whey protein stimulate muscle protein synthesis to a greater degree than other sources such as casein. In addition, whey protein has a higher biological value than casein, which means that it is better absorbed and utilized by the body. Introducing the revolutionary micellar whey protein! Muscletech Nitrotech Performance Nighttime changes the protein landscape by presenting micellar whey protein – a unique form of whey that has been designed to have larger whey protein particles, giving it a slower absorption rate that makes it an ideal source of protein to consume before heading to bed! Each serving of Muscletech Nitrotech Performance Nighttime provides your body with 25g of 100% micellar whey the ingredient that are required by the body for building, repairing, and protecting lean muscle mass. Harness the unmatched biological value of whey protein in one revolutionary formula... try Muscletech Nitrotech Performance Nighttime today! Have a question about Nitrotech Performance Nighttime? What is it, what does it do, how and when to use or something else? Ask us. ALLERGEN INFORMATION: Contains Milk and Soy.,Processed in a facility that processes egg, fish, tree nut, and wheat ingredients. Mix 1 to 2 servings (1 to 2 scoops) with 240-480 ml of cold water or skim milk in a glass or shaker cup and consume before sleep. WARNINGS Nitrotech Performance Nighttime : Not intended for use by persons under age 18. Do not use if pregnant or nursing. Consult a medical doctor if you have a medical condition or before starting any diet or exercise program. Keep out of reach of children. Do not use if packaging has been tampered with. Store in a cool, dry place (60 F to 80 F). Use this product as a food supplement only. Do not use for weight reduction. These statements have not been evaluated by the Food and Drug Administration. This product is not intended to diagnose, treat, cure, or prevent any disease.